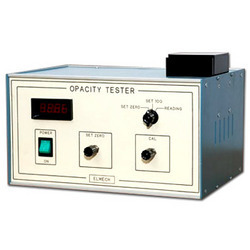 We are a leading Manufacturer of opacity tester from New Delhi, India. We are the leader in the country for manufacturing high quality Opacity Testers that have extensive applications in the testing of PVC sheets, pipes and many other translucent materials. These Opacity Testers are available with a digital automatic display that shows the most appropriate and accurate readings. We have a firm and renowned position in the Indian market for supplying and manufacturing Opacity Testing Equipment. Looking for Opacity Tester ?